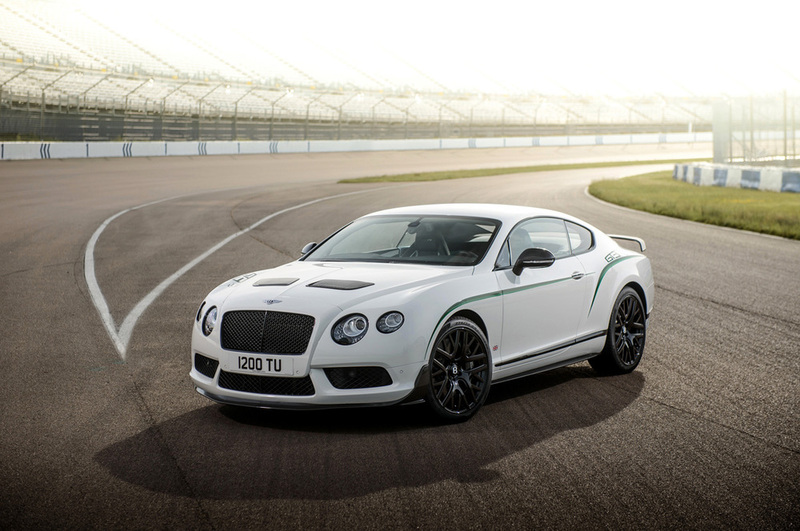 While us regular folk can't get our grubby hands on the Continental GT3 Race Car, Bentley has seen fit to build a limited run of 300 of these this monstrous road cars featured in the album. Each one will be in the Glacier White with those green and black accents you see there. Reaction has been mixed since the unveiling, with internet commentators exclaiming "they've lost the plot" and "If I wanted a sports car I'd buy a Porsche, just stick to making luxury cars". Everyone's entitled to their opinion of course, but lets take a look at what Bentley has done and why they went to the effort. The GT3-R shares the race car's twin-turbo 4.0 liter V8, and is only 28hp down from the racer's horsepower figure (I suspect a few of the more exotic components have been nixed to keep the price down). At 571hp and 516 lb-ft, it easily bests the GT V8 S (but fails to take the title the most powerful road legal Bentley from the GT Speed at 616hp), and astonishingly the torque figure matches that of Bentley's own 6.0 liter W12 engine - the effect of modern high boost turbochargers. Performance is what you'd expect from such an impressive engine - 60mph comes up in just 3.6 seconds and it'll go on to a top speed of 170mph. They've added torque vectoring to the AWD system (this controls the torque sent to each rear wheel to better keep things happy when powering through corners) and increased the gap between comfort and sport modes to make them feel more defined. Massive 16.5-inch front carbon ceramic discs (and 14 piddly inch rears) handle the braking duties and come standard on the GT3-R (a nearly $14k option on the GT V8 S). For the interior they lost the rear seats, added a titanium exhaust, lightweight buckets up front, carbon and alcantara everywhere, and all together this added up to a 200lb weight loss. Not bad, but lets not forget that still leaves her with a curb weight of 4,839 pounds - I guess it's the thought that counts. The limited run is here to recognise Bentley's recent success, winning the Silverstone round of the Blancpain Endurance Series. Somewhat surprisingly this was the British manufacturer's first win in a top-tier race in 84 years - so you can see why they want to make a bit of noise about it. Good for them, and good on any of the lucky 300 that stump up the cash for this GT3-R. Here's the Continental GT3 Race Car doing its thing on the track so you can better judge where the inspiration for the GT3-R came from.